When we have cough, cold, fever or any other physical ailment we don’t think twice before seeing the doctor or the general physician. But when we experience loneliness, trauma, or any mental distress we hesitate to see a Mental Health Professional…why? Because more than ourselves we love our image, our status, and we care about what people say. Thoughts like “Will my boss think I am not worth the job?”, “My husband is mad; he sees a psychiatrist”, “What I am experiencing is just a phase and I will be fine after a couple of drinks”, “This cannot happen with me…I must die!” run in our heads as a result of which we stop ourselves from seeking professional help. This attitude has helped mental disorders be major contributors to illness and premature death, and today it is responsible for 13% of the global disease burden. Most physical ailments can be treated if timely treatment is taken from a trained physician. Certain diseases like diabetes, blood pressure cannot be cured, but one can learn to effectively cope with it through medication, healthy diets, and exercise. Certain mental illnesses such as schizophrenia, dementia cannot be cured, but one can learn to effectively cope with it through medication and psychotherapy. It can drain the physical strength and energy of the affected individual. It can drain an individual’s capacity to think and act rationally, and express emotions appropriately. Despite these similarities we have developed an indifferent attitude towards mental illnesses. On an average, one person dies by suicide every 40 seconds somewhere in the world because we as a community endure stigma, discrimination, and victimization of individuals affected by mental illnesses by depriving them of their political and civil rights and constraining their ability to participate in the public life of their societies. 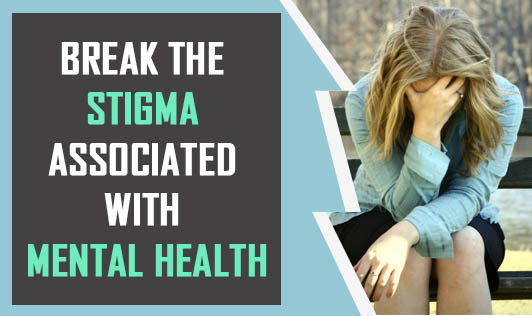 Together we can pluck out the stigma associated with Mental Health! If any of you or your loved ones are experiencing distress, do not hesitate in seeking help from a mental health professional. Pick up your phones and immediately talk to your wellness coach. Remember what you share with them stays confidential!